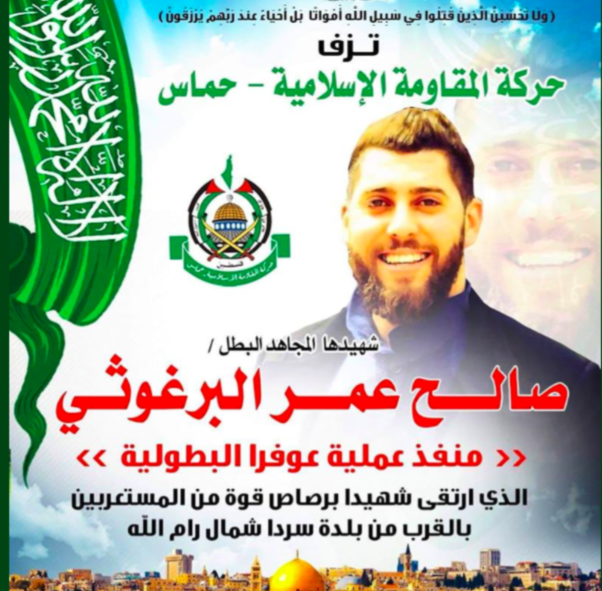 “Hamas announces with great pride the death of its martyr Salih Omar Barghouti, the perpetrator of the heroic Ofra operation,” the terror group wrote on its official Twitter account early Thursday morning. While Hamas claimed Barghouti as a member, it did not specifically say that it orchestrated the attack. Barghouti comes from a family with extensive terrorist ties, including a father and uncle who were convicted of murdering an Israeli soldier in 1978. The uncle, Nael Barghouti, is one of the longest-serving Palestinian prisoners in Israel’s history. Seven people were wounded in the drive-by shooting attack on a bus stop outside of Ofra on Sunday night, including a 30-weeks pregnant woman who was seriously injured. The baby was delivered in an emergency operation, but died on Wednesday afternoon. 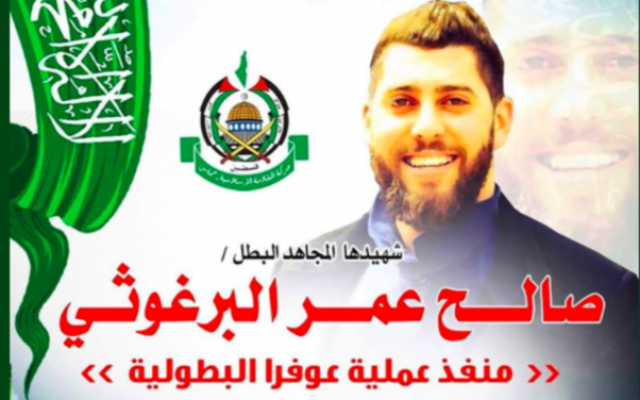 Barghouti, 29 and a resident of Kobar, a village near Ramallah, was killed Wednesday evening after he tried to attack troops while escaping arrest and was shot, the Shin Bet security service said, adding that he was believed to have carried out the Ofra terror attack. Four other people suspected of being involved in the attack were arrested, the Shin Bet said. Palestinian news outlets said Barghouti was killed when troops opened fire on a taxi he was traveling in on a road in the town of Surda, a village also near Ramallah. For the past three days, soldiers have been carrying out intensive searches for suspects involved in the terror attack. The announcement of Barghouti’s death and the arrests took place shortly after the funeral for the newborn, and after Prime Minister Benjamin Netanyahu vowed the army would catch those involved in the attack. Late Wednesday, troops also raided a home in Kobar belonging to Barghouti’s family and surrounded a building in Ramallah, according to Palestinian reports. Clashes subsequently broke out between the troops and young Palestinians near the home in Kobar, according to the official PA news site Wafa. During the clashes, two Palestinians were injured by live fire, Wafa reported. Pictures shared on social media appeared to show an IDF vehicle towing a white car that seemed to match a vehicle seen on security video of the terror attack, from which the shots were fired at the bus station in Ofra. In security video showing the terror attack, a white car can be seen opening fire as it passes by the bus stop. A taxi traveling alongside the white car was suspected of being involved in the shooting as well. Barghouti worked for the Rafideen taxi company, an employee at the company told The Times of Israel. The company is based in Ramallah. He had worked the past three days, according to the employee, who asked to remain unnamed. Earlier, hundreds of mourners gathered at Jerusalem’s Mount of Olives cemetery Wednesday night for the funeral of a newborn. The infant, born after Sunday’s shooting by emergency Caesarean section, was pronounced dead earlier in the day by doctors at the Shaare Zedek Medical Center in Jerusalem after several days in intensive care. Some 300 hundred people crowded around the fresh gravesite on the Mount of Olives, overlooking Jerusalem’s Old City, using umbrellas to shield the baby’s tiny body, wrapped in a prayer shawl and smaller than a shoe box, from the steadily falling rain. Barely able to speak between sobs, grandfather Refael Ish-Ran said despite the baby’s short life, few people had “managed to unite the nation of Israel” like he had. “You brought so much light. And with all the light that you brought, we will extinguish their darkness,” he said in his eulogy. The baby’s parents, Shira and Amichai Ish-Ran, were both recovering from gunshot wounds at the hospital and unable to attend the funeral. Shira, who was 30 weeks pregnant at the time of the shooting, was seriously wounded in the shooting, but doctors said Wednesday her condition was improving. 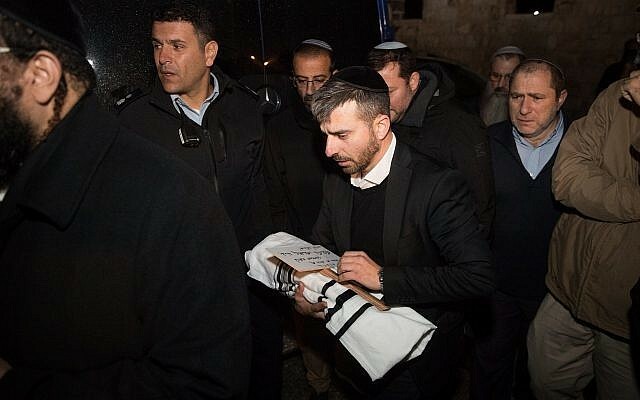 Shortly before the burial, the baby underwent a symbolic circumcision and was named Amiad Yisrael. The parents had only been able to visit the baby on Wednesday morning.